Mike over at Vox Political has several times commented on stories in the mainstream media, which suspiciously repeat some of the points he’s made in his articles. Now it’s the turn of the I’s columnist, Deborah Orr, to catch up with some of the points Mike’s been making about the grossly disproportionate influence the DUP now has, thanks to the Tories’ dependence on them for support in the Commons. And the way this has meant that effective devolved government won’t be coming back to Ulster any time soon. The power sharing agreement between Sinn Fein and the DUP collapsed last year, and since then Ulster’s been governed from Westminster. After Eire voted by a two-thirds majority to legalise abortion, feminists – not necessarily female – have been calling for a similar referendum in the Six Counties, where abortion is also illegal. But the DUP and Arlene Foster are very firmly against abortion, and don’t want to give the people of Ulster the choice of whether it should be legal or not. And because May needs their support, she really isn’t going to risk alienating them by giving them the referendum many are calling for. Nor is she going to risk losing them by handing power back to Stormont. And so, thanks to Foster and her far right hordes, Ulsterwomen don’t get to vote on what can be a matter of life and death – not just for unborn children, but also for the mothers – and Ulster’s people are denied their right to self-government. Orr is also one of the columnists, who’ve repeated the anti-Semitism smears against the Labour party and Ken Livingstone. Last week in her column she claimed that Leninspart had said that Hitler was a Zionist, and called him ‘a fool’. In fact, the depraved Marxist newt-fancier had said no such thing. He had said that Hitler briefly supported Zionism ‘before he went mad and killed the Jews’. This is actually solid, established fact. Under the Ha’avara Agreement, the Nazis did support sending German Jews to Israel with the Zionist organisations. As Mike’s pointed out over and again, you can find this on the website of the International Holocaust Museum in Israel. Livingstone’s comment that Hitler killed the Jews in the Holocaust only after he went mad is wrong. Historians of the Third Reich have argued that the implications of Hitler’s anti-Semitism were clear from the outset, even if he only started murdering the Jews en masse from 1942 onwards. The Nazis made absolutely no secret of their murderous hatred of the Jews. Joachim C. Fest in his biography of Hitler records how the Nazis in Berlin even sang about having ‘the Jew lies bleeding at our feet’. This is quite apart from their real attacks on Jews, and their brutal persecution in Germany and Austria before the Final Solution. However, Leninspart hasn’t been smeared as an anti-Semite because of his belief that Hitler hadn’t planned the Jews extermination from the start. He was smeared because he raised an awkward fact of history that the Israel lobby, and its enabler in the mainstream press and the political parties, can’t tolerate: that Hitler briefly allied with the Zionists, without being a Zionist himself. And Orr couldn’t tolerate that fact herself. Or perhaps she was just too lazy and complacent to research the historical fact behind Livingstone’s statement. Either way, she was happy to repeat the Israel lobby’s contemptible lie. Either way, her article shows that if you really want to know what’s going on, check Mike’s blog, and those of the other great left-wing bloggers and vloggers he follows and cites. 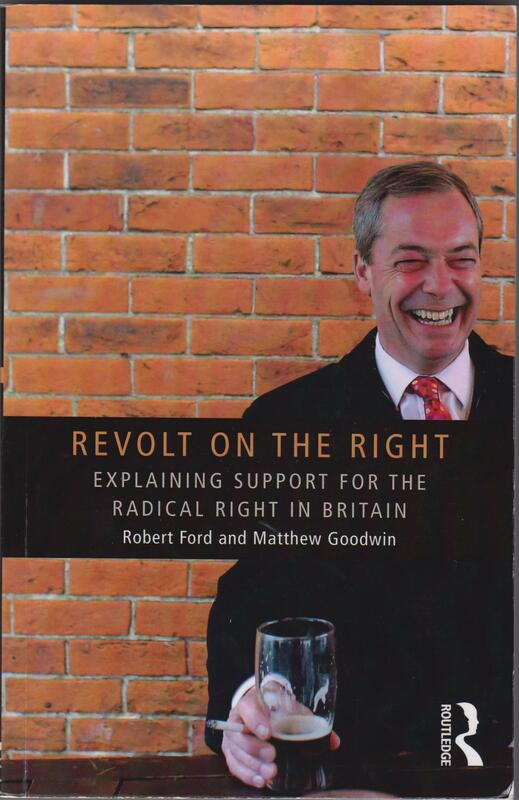 Revolt on the Right: Explaining Support For The Radical Right in Britain, by Robert Ford and Matthew Goodwin (Abingdon: Routledge 2014) traces the history and changing fortune of UKIP from its foundation in 1991 as the Ant-Federalist League to today, when the party appears to have overtaken the Lib Dems to take its place as one of Britain’s leading the parties. It’s part of a series of texts published by Routledge on the theme of ‘extremism and democracy’. Most of these books are devoted to the Fascist and racist Right, though it also includes a book on Left-wing terrorism, general political extremism, and studies of terrorism in America, from the KKK to al-Qaeda. A fair bit of the book is statistics taken from sociological and political surveys, dealing with political, social and economic attitudes and electoral performance. Most of these are straightforward, but not exactly easy or riveting reading. Much more interesting is the history of the party itself. It also includes sample quotations from UKIP supporters explaining their reasons for supporting the party, and rejection of the three others. It covers the various leadership struggles, including perma-tanned talk show host Robert Kilroy-Silk joining the party, only to leave after failing to take control. It also suffered in its early days from competition from James Goldsmith’s Referendum Party, a true single-issue party that solely existed to campaign for a referendum on Europe. With the advantage of Goldsmith’s considerable fortune behind it, UKIP was very much the poor relative, lagging behind the Referendum Party in both funding and publicity. Pearson of Rannoch, the party’s leader in 2010, was also known for his vitriolic views against Islam, which he sees as fundamentally incompatible with the British tradition of gender equality and democracy. He invited Geert Wilders to Britain to present his film, Fitna, to parliament. The book discusses these views, and the impact they had on the party. For the first time they went into a general election with relatively detailed proposals on domestic and foreign policy and a costed economic programme, all of which were organised around four central principles: personal freedom; democracy at the national and local level; small government; and tax reduction. UKIP were pushing ahead with a clear attempt to rally a coalition of socially conservative and financially insecure working-class voters, offering them tough opposition to the EU and immigration, but threatening also a range of measures designed to appeal to their economic needs and right-wing ideological preferences: a flat-tax to help the lowest paid workers, investment in the manufacturing sector, new jobs for manual workers, more police on the streets, stronger prison sentences for criminals, grammar schools, an end to political correctness, Swiss-style referenda, a more proportional election system and the restoration of British values. UKIP were no longer the single-issue, anti-EU pressure group: they had become a fully-fledged radical right party. (pp. 84-5). tasked with leading a policy review, designed to rebrand UKIP as campaigning for independence from the established political class, whether in Brussels or Westminster. Activists talked of presenting the disgruntled electorate with a ‘radical libertarian alternative’ to the ‘social democratic consensus’. (p. 71). UKIP are populist Neoliberals, like the rest of the contemporary political parties. They are not moderates, and as the rejection of the ‘social democratic consensus’ indicates, are anti-socialist. It was also in this period that UKIP’s electoral base shifted. UKIP began receiving increased support in areas with a higher proportion of working class voters than average, with poor education and health. They lost support in in areas with larger than average proportion of middle class professionals and university graduates. As the financially more secure and socially more liberal middle classes in Europe continued to grow, so their influence on electoral competition and centre-left politics became ever stronger. These new groups brought a distinct set of values and priorities to the left-wing parties they joined. Their ‘post-material’ agenda prioritised issues like the environment, civil liberties, global social justice and human rights, prompting centre-left parties to overhaul their strategy to win them over. Socialist economic ideas of a planned economy and strong state intervention were downplayed, and replaced by an acceptance of a strong role for free markets and a globally integrated economy. Redistribution and workers’ rights were also given less emphasis, with a greater focus on improving public services, a cause which united both ‘new’ and ‘old’ left, and on efforts to boost opportunities rather than equalise access to resources. Across Europe, the centre-left also shifted more firmly in favour of European integration. Whereas previously some social democrats had been openly hostile towards the Europe project, viewing it as a capitalist club that opposed socialism, from the 1980s they became more supportive, viewing the EU instead as a valuable mechanism through which they could tame capitalism and entrench social democratic principles at the supranational level. But as Przeworski predicted, these changes came with a cost: the new middle-class agenda marginalised the left’s traditional voters. Their old working-class electorates became dissatisfied with a political system where their traditional voice appeared to have been lost and showed a growing willingness to back more radical parties that articulate their sense of abandonment from the mainstream and responded to their concerns about issues that aroused little interest among new left elites: immigration; national identity; the perceived threat from the EU; and rapid social change more generally. In Britain many White working class voters became increasingly alienated from Labour because of its attempts to retain the loyalty of the ethnic minorities. These had become a significant part of the electorate by the turn of the millennium, and their support for Labour was no longer guaranteed. Many Muslims, for example, had expressed their opposition to the invasion of Iraq by joining the Lib Dems or Respect. Labour attempted to win their support through a liberalisation of the immigration system, tougher legislation against racial discrimination and the promotion of more Black and Asian candidates for parliament. The result of this was that many of the disadvantaged White voters felt that Labour cared more about immigrants than them. Furthermore, the party’s promotion of laissez-faire economic liberalisation also alienated many of the same voters, who now believed that the party was only concerned for the rich. Previously the voters alienated by Labour’s anti-racism would have voted Conservative, but they were also alienated from Cameron’s party by his adoption of the same attitudes to race and multiculturalism as Blair. The result has been that these voters turned to UKIP. The book notes that UKIP’s apparent breakthrough into mainstream electoral politics is very recent. Even in the middle of the last decade the party was gaining only 1-2 per cent of the vote on average. For most of the party’s history, very few of their candidates ever even gained enough votes to retain their deposit. They also compare the party’s rise with that of the SDP. When this split from the Labour party, it had a fair size of the vote and was expected to break the mould of the two-party system. Instead it eventually collapsed and was merged with the Liberals. The authors see its failure, compared with the apparent success of UKIP, as due to the origins of the SDP in a split at the top of politics, rather than arising from the electorate itself. The dilemma Labour face is between short-term and long-term strategy. In the short term, the strong temptation for Labour will be to sit back and let UKIP divide the Conservative vote at the next general election, thereby lowering the bar for their own victory and a return to power. Some Labour commentators have taken pleasure in the irony of an electoral split undoing the right in the same way as the left has been undone many times in the past. Yet such as ‘laisser faire’ approach to UKIP comes with serious longer-term risks. As we saw in chapters 3 and 4, the UKIP vote comes primarily from ‘left behind’ social groups who were once solidly Labour. UKIP have driven a wedge between the struggling, blue-collar ‘Old Left’, who once supported Labour on economic grounds, and the educated, white-collar ‘new Left’ who often back them on the basis of social values. If they allow UKIP to become established as part of the mainstream political conversation, either with MPs at Westminster or a strong presence in labour heartlands, the centre-left risks making that divide permanent. It will be much harder for Ed Miliband and his party to win back working-class voters with Ukippers running continuous and high profile campaigns on Europe, immigration and traditional British values. Labour also need to remember that UKIP’s rise has been driven as much by populist hostility to the political establishment as by ideology or policy. This does not hurt them much at present, as they are in opposition and therefore not the main focus of anti-system feeling. If they were to win the next elect, they would find UKIP’s populist barbs directed at them. A failure to combat UKIP before 2015 will result in a stronger populist opponent to future Labour governments. The book describes UKIP as a paradox. This is absolutely correct. They are a working class party, whose leadership has adopted all the Neoliberal policies of the Conservative Right. Despite their demands for more democracy, they are very strongly anti-working class. if you want examples, go over and look at the Angry Yorkshireman’s discussion of their domestic policies over at Another Angry Voice. And their deputy leader, Paul Nuttall, has stated that he wishes to privatise the NHS. The right-wing, Eurosceptic, anti-NHS Conservative MEP Daniel Hannan has also suggested that the Tories should form an alliance with UKIP. If UKIP did gain power, either by itself or in coalition with the Tories, it would be the working class that would suffer immensely. UKIP have raised and brought to prominence a number of pressing and vital issues – like the continuing role of race and ethnicity in politics, the need to protect an increasingly alienated working class, but they themselves are no solution to these problems.